Zebra are often hard to spot with their symmetry of pattern lines. They blend in well against a rocky background and the patterns confuse the predator when they are on the move. “Symmetry is this week’s photo challenge. Click here to find more examples of this week’s subject. Love this straight-on shot. So hard to get. Whistfulness?! You’ll have to come and visit! Yes, that’s right – the animals tend to always be side on. This fellow is curious though, a youngster and not as nonchalant as it’s parents. Oh Liz this is a wonderful photo, I wish I’d taken it! Wish I could send the real thing through the ether to you Gilly 🙂 … augmented reality?! I always look out for the zebra – they’re quite shy but a couple of times i’ve got quite close up to them while cycling. It’s interesting as they view cyclists differently to motorists, guess it’s the size and the different pace of movement. Always feel more on an equal footing so to speak. This is the foal which was born in 2011, still sub-adult. I agree with the commenters above – magnificent. The light is perfect and the animal a beauty. The golden tinge in the face is marvellous against the strict black and white. That’s fantastic – like our finger prints. 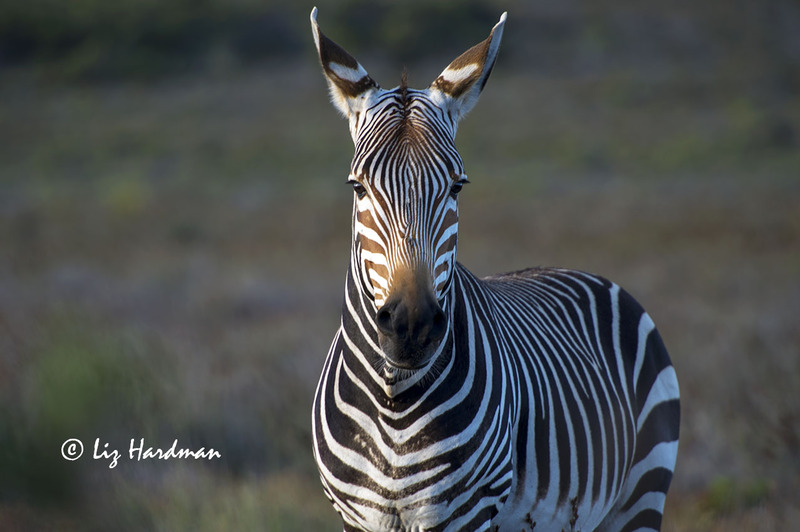 Beautiful photo of the mountain zebra Liz, I love the twinkle you caught in its eye! Thanks de Wets! Glad I got it’s twinkle as it’s the most boisterous and the youngest member of the small family group which lives in Cape Point Reserve. I keep hoping that there will be another foal one of these days. What a gorgeous photo Liz. Liz- great idea and a suberp photo. Oh just take a look at the beautiful beast. A perfect pattern that you captured!